I don't buy nearly as many compilations as I did when I was younger. I actually picked this one up quite some time ago, but have just been dragging my feet on reviewing it. I had mostly bought it for the at the time unreleased Beach Slang song, Although I was also already familiar with Hurry and Spraynard. Also, I should note that this is a benefit compilation and all proceeds from this album are going to United Cerebral Palsy. Spraynard start things up with another one of their passionate, Iron Chic style punk rock offerings. "Haulin' Oats" is every bit as good as anything else they've released, so this is definitely not a throwaway. Next up is The Weaks. I've not heard of them before, but they really surprised me with their offering. "Call Me Away" is big and crunchy like the best kind of failed 1990's major label band. Reminds me a bit of Fig Dish. I really dig this song. 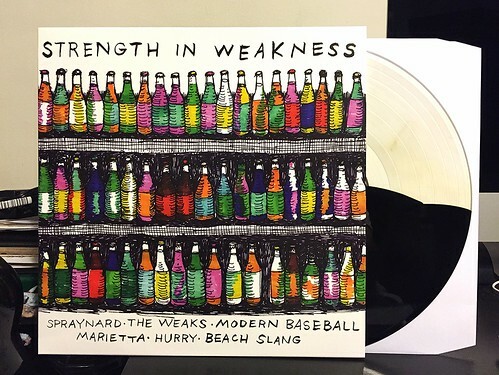 Modern Baseball fills out the last song on the A side. This is a band I have heard of before, but never really listened to anything of theirs. I'm not sure this song will be one to change my mind as it's kind of slow and boring. Side B doesn't start off on the best foot. "Old Joe" by a band called Marietta is pretty dull and unremarkable, just plodding along. Things pick up with "Shake It Off" a fantastic song by Hurry, though it is also on their most recent full length album as well. Still a highlight for sure. Finishing up is a fully acoustic version of the Beach Slag song "Too Late To Die Young." It's really not too dissimilar from the version that ended up on their full length, though there's lots of extra static on the vocals on this compilation version. It is a good song, but it's not really all that necessary if you have the Beach Slang album. Still, this is a good little compilation for a great cause. More than anything The Weaks song really blew me away, I'm going to have to look into those guys a bit more.